“When I first started college, I had a real passion for orthopedic surgery, because I saw it as a way to stay active in athletics.” As a wrestler in high school and college, Dr. C suffered a number of minor injuries. His uncle was able to help him so much that he decided chiropractic was the right career for him. 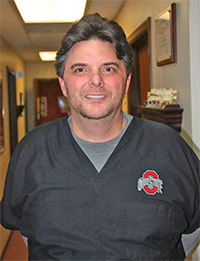 Ohio is home to Dr. C. “I attended Ursuline High School and Youngstown State University before graduating with a degree in Health Sciences from Findlay University.” He ventured to Chicago to study chiropractic at National College of Chiropractic (now the National University of Health Sciences). After graduation from chiropractic school, Dr. C joined his uncle’s practice in Boardman before opening Allied Pain Relief Clinics, Inc in Niles in 1994. Off the field, Dr. C enjoys golfing and spending time with his kids. He also has a love for vintage cars. He frequently presents educational seminars about health and wellness to his local community, and has served on the Boards of several charitable organizations, including Big Brothers Big Sisters of Mahoning Valley. Come in today to meet Dr. C and start feeling better!